According to the research arm of First Bank of Nigeria, data gleaned from a new report series from the National Bureau of Statistics in collaboration with the CBN reveal that 304 million transactions valued at N22 trillion were recorded on electronic payment channels in Q1 2017, that ATM transactions dominated with a volume of 179 million. The researchers say Internet subscriptions directly correlating with electronic transactions stood at 90 million in March 2017, according to the Nigerian Communications Commission, translating to 49% penetration. Equally, based on data from the Nigeria Interbank Settlement Systems (NIBSS), total active bank accounts in the country amounted to 67 million in February. “Although there was a 13.2% y/y increase, only 35% of the country’s population is currently exposed to electronic payment transactions. Financial inclusion is still far from its optimal level,” they noted. The data also indicate that mobile payments stood at N461bn in Q1 2017, representing a year-on-year (y/y) growth of 93%. However, it accounted for just 4% of total electronic transactions under the review period. However, the volume of Point-of-Sale (PoS) transactions shows the impact of the cashless policy on the economy. 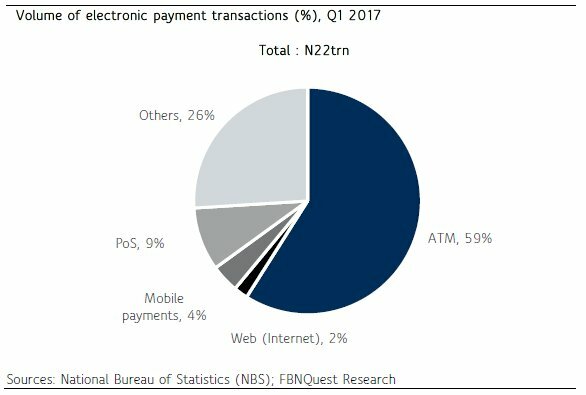 The NBS data show that 27 million PoS transactions were recorded in Q1 2017; when compared with the corresponding period in 2016, this represented a 125% increase. The Increased electronic transactions results in better transparency and efficiency gains in both the public and private sector. However, one downside is the threat that cybercrime poses. According to industry sources, N2bn was lost in 2016 to cybercrime. PreviousWhich companies have the highest revenue per employee?